But here, for now, we only look at the final result. Once a DNN is trained, what is left are the weights (and biases). We can reuse the weights (and biases) of a pre-trained DNN to build new DNNs with transfer learning. And if we train a bunch of DNNs, we want to know which one is better ? But, practically, we would really like to identify a very good DNN without peaking at the test data, since every time we peak, and retrain, we risk overtraining our DNN. I now show we can at least start do this by looking the weights matrices themselves. So let us look at the weights of some pre-trained DNNs. Pytorch comes with several pretrained models, such as AlexNet. To start, we just examine the weight matrices of the Linear / Fully Connected (FC) layers. The Linear layers have the simplest weight matrices ; they are 2-dimensional tensors, or just rectangular matrices. The eigenvalues are just the square of the singular values. Notice here we normalize them by N.
We could also compute the spectral density using a Kernel Density Estimator (KDE); we save this for a future post. Here, we examine just FC3, the last Linear layer, connecting the model to the labels. The other linear layers, FC1 and FC2, look similar. Below is a histogram for ESD. Notice it is very sharply peaked and has long tail, extending out past 40. We can get a better view of the heavy tailed behavior by zooming in. Do we have a Power Law ? But this is harder to do than it seems. And statisticians love to point this out. Don’t be fooled–we physicists knew this; Sornette’s book has a whole chapter on it. Still, we have to use best practices. AlexNet FC3: Log log histogram of the Empirical Spectral Density (ESD). Notice the central region is mostly linear, suggesting a power law. Yes, it is linear–in the central region, for eigenvalue frequencies between roughly ~1 and ~100–and that is most of the distribution. Why is not linear everywhere? Because it is finite size–there are min and max cutoffs. In the infinite limit, a powerlaw diverges at , and the tail extends indefinitely as . In any finite size data set, there will be an and . Second, fit the data to a power law, with and in mind. The most widely available and accepted method the Maximum Likelihood Estimator (MLE), develop by Clauset et. al., and available in the python powerlaw package. The D value is a quality metric, the KS distance. There are other options as well. The smaller D, the better. The table below shows typical values of good fits. The powerlaw package also makes some great plots. Below is a log log plot generated for our fit of FC3, for the central region of the ESD. The filled lines represent our fits, and the dotted lines are actual power lawPDF (blue) and CCDF (red). The filled lines look like straight lines and overlap the dotted lines–so this fit looks pretty good. We still need to know, do we have enough data to get a good estimate for , what are our error bars, and what kind of systematic errors might we get? This so-called statistically valid MLE estimator actually only works properly for . The green line is a perfect estimate. The Powerlaw package overestimates small and underestimates large . Fortunately, most of our fits lie in the good range. Is a Power law the best model ? and R and the the p-value. If if R<0 and p <= 0.05, then we can conclude that a power law is a better model. Note that sometimes, for , the best model may be a truncated power law (TPL). This happens because our data sets are pretty small, and the tails of our ESDs fall off pretty fast. A TPL is just a power law (PL) with an exponentially decaying tail, and it may seem to be a better fit for small data, fixed size sets. Also, the TPL also has 2 parameters, whereas the PL has only 1, so it is not unexpected that the TPL would fit the data better. 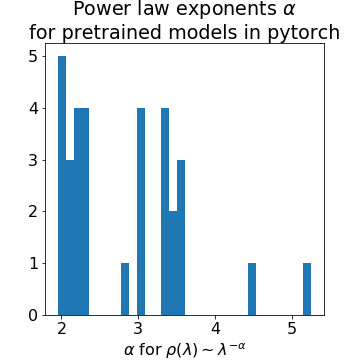 Powerlaw exponents for ESD of Fully Connected / Linear layers of numerous pretrained ImageNet models currently available in pytorch. The table below lists all the fits, with the Best Fit and the KS statistic D.
Notice that all the power law exponents lie in the range 2-4, except for a couple outliers. There is a deep connection between this range of exponents and some (relatively) recent results in Random Matrix Theory (RMT). Indeed, this seems to suggest that Deep Learning systems display the kind of Universality seen in Self Organized systems, like real spiking neurons. We will examine this in a future post. Training DNNs is hard. There are many tricks one has to use. And you have to monitor the training process carefully. Here we suggest that the ESDs of the Linear / FC layers of a well trained DNN will display power law behavior. And the exponents will be between 2 and 4. A counter example is Inception V3. Both FC layers 226 and 302 have unusually large exponents. Looking closer at Layer 222, the ESDs is not a power law at all, but rather bi-model heavy tailed distribution. We conjecture that as good as Inception V3 is, perhaps it could be further optimized. It would be interesting to see if anyone can show this. We can either input , or search for the best possible estimate (as explained in the Clauset et. al. paper). Notice, however, that this estimator does not explicitly take into account. And for this reason it seems to be very limited in its application. A better method, such as developed recently by Thurner (but not yet coded in python), may prove more robust for a larger range of exponents. Many Conv2D layers show very high exponents. What could this mean? The PL estimator is terrible for large exponents. We need to implement a more reliable PL estimator before we can start looking at Conv2D layers. Or, perhaps it is simply that the Linear layers, being fully connected, are also fully correlated, whereas the Conv2D layers do less work. It will be very exciting to find out. Code for this study, and future work, is available in this repo. Bio: Dr. Charles Martin is a specialist in Machine Learning, Data Science, Deep Learning, and Artificial Intelligence. He helped develop Aardvark, a Machine Learning / NLP startup acquired by Google in 2010. He currently runs a boutique consulting firm specializing in software development, machine learning and AI. His clients include Wall Street firms, Big Pharma, Telecom, eCommerce, early and late stage startups, and the largest Internet companies such as eHow, eBay, GoDaddy, etc. Why Does Deep Learning Work? Why Do Deep Learning Networks Scale?